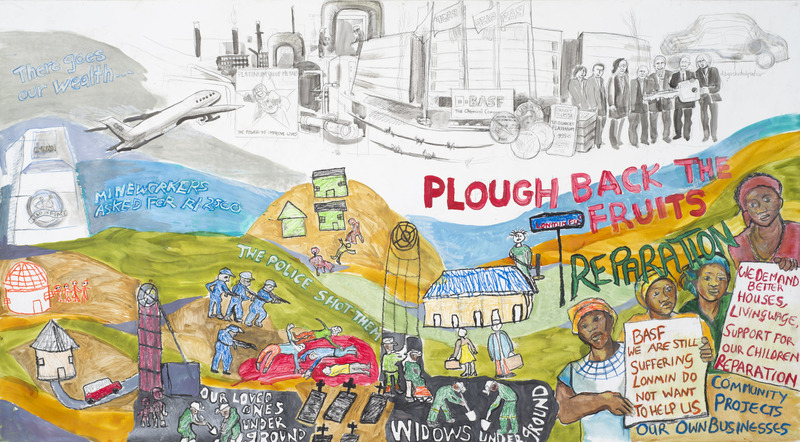 Widows of Marikana: Plough Back the Fruits, Oil pastels & food colouring on paper, 280 x 150cm, February 2016. It ends in the production of catalysts in Germany, US-American or Japanese factories. It begins in South African mines. In the “platinum belt”, north of Johannesburg, you can find around 80 per cent of the world’s platinum deposits, belonging to the groups in Platinum Group Metals (PGM). Platinum is now the most valuable precious metal in the world, and Germany is – after the USA – its second largest importer. The miners who extract these minerals often live in very poor conditions in informal settlements near the mine, without running water or electricity. In 2012, around 3,000 miners struck for higher wages and better living conditions. 34 miners were shot dead by the South African police. The Government Commission of Inquiry reported that the mine owner, the British company Lonmin, was partly responsible for the massacre. One of the principal buyers of Lonmin’s platinum is BASF, the world’s largest chemical company and manufacturer of catalytic converters. The company has on various occasions declared that its responsibility in the supply chain verification is just. BASF has not yet issued a comprehensive statement on the massacre and the poor living conditions of the people on Marikana, which caused the strike (see more information about BASFs reaction to the address of Bishop Jo Seoka in April 2015, here in our Archive).